Choose the noninvasive measurements that are right for your clinical setting—oxygen saturation, pulse rate, and perfusion index in addition to total hemoglobin, total arterial oxygen content, PVI, carboxyhemoglobin, and methemoglobin. 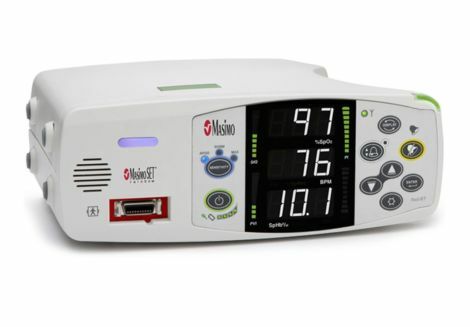 > Featuring "gold standard" Masimo SET pulse oximetry, proven in more than 100 independent and objective studies to provide the most accurate and reliable SpO2 readings during motion and low perfusion. > Built-in wireless radio for bi-directional communication with the Masimo Patient SafetyNet® remote monitoring and clinician notification system. > Upgradable Masimo Rainbow SET technology platform lets you add total hemoglobin (SpHb™) and oxygen content (SpOC™) through simple field-installed software upgrades. > Additional upgrades allow you to continuously and non-invasively measure carboxyhemoglobin (SpCO®), methemoglobin (SpMet®) and PVI®. The Rad-87 features a built-in radio for wireless communication with Masimo Patient SafetyNet, the remote monitoring and clinician notification system that helps you keep at-risk patients safe on general care floors. Battery power allows for continued transmission during patient ambulation. A simple, user-centered design allows activation of many features with only a single touch. Easy-to-read high-contrast display eliminates confusion common with many bedside monitors. One sensor, multiple measurements. All Rainbow measurements can be displayed on the Rad-87 through a single noninvasive sensor. Alarms and alerts can be enabled at the bedside or remotely, via the Masimo Patient SafetyNet Remote Monitoring and Clinician Notification System.